A Boston Family's Struggle With TB Reveals A Stubborn Foe : Shots - Health News Tuberculosis is much less of a health threat in the United States than it is in other countries. But a family in Boston discovered that even here, no one is immune from this ancient foe. 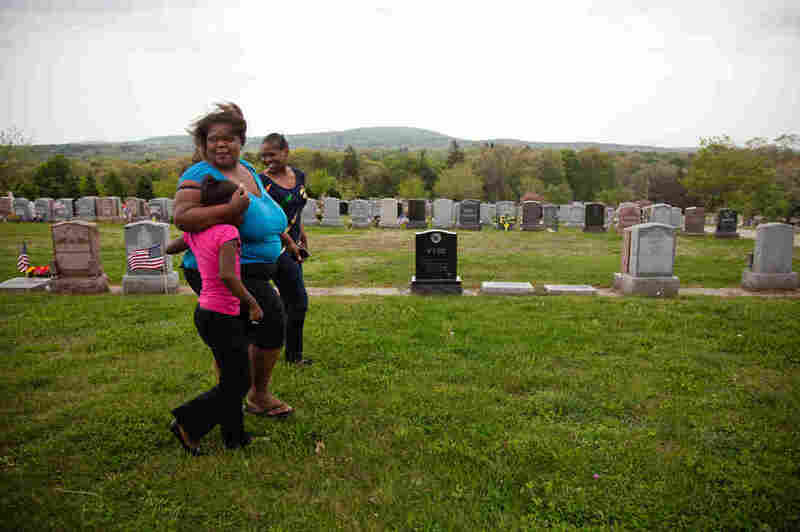 More than a dozen family members were infected with TB, and matriarch Judy Williams died at age 59. Thanks to gold-standard tuberculosis treatment and prevention programs, cases of TB in the United States have declined every year for the past two decades — to the lowest level ever. But TB's course through the Williams family in Boston shows that no nation can afford to relax its efforts to find, treat and prevent TB. It's just too sneaky and stubborn an adversary. One-third of the human race is infected with tuberculosis, a persistent public health problem that kills 1.4 million people a year. The Williams family story begins in late 2010, when Judy Williams lost her appetite and energy and began to lose weight at a great rate. She was the matriarch of a large extended family, with three generations under one roof and many friends and relatives who often dropped in. That's an important element of our story. Her son Robert says Judy Williams "would always cook for people, invite people into the house. Like the homeless — she let them stay there with the family and all. She was just very kind to everybody." 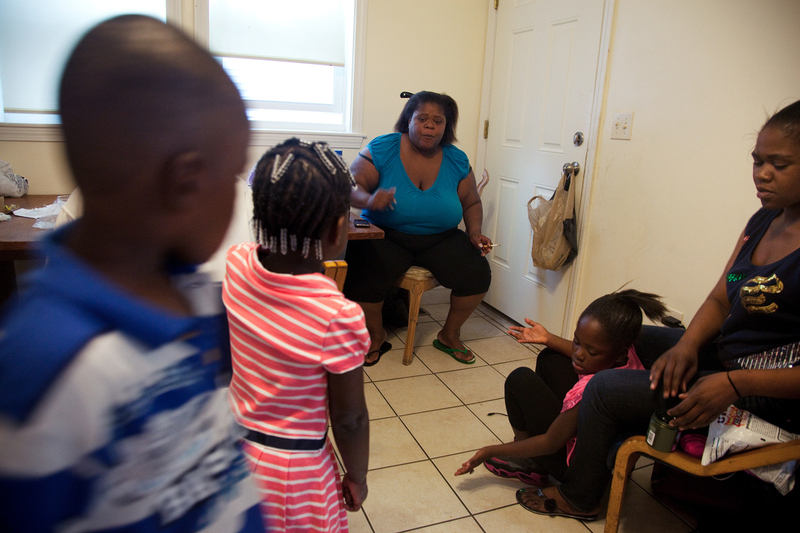 Michelle Williams (center), at home in Dorchester, Mass., talks with grandchildren Ayniah Williams (pink dress) and Drequain Smith (far left). At right are her daughters Vanessa "Nessa" Williams (far right) and Margaret Williams. Both Michelle and Ayniah had latent TB infections and have been treated. And that may be how she got TB. She may have had a silent, noncontagious infection for years. Judy Williams seems like an unlikely case of TB infection. For the last three decades of her life, she rarely ventured outside the family home. Robert thinks it's because she was afraid of street violence. Her daughter Michelle thinks she had a mental disorder — a fear of the outside world that doctors call agoraphobia. Whatever the reason, her reclusiveness would seem to put Judy Williams at very low risk of getting TB. As much as she took care of others, Judy Williams never took care of herself. She smoked, and at one point she weighed close to 400 pounds. But then she stopped cooking and retreated to her room. Her weight dropped 150 pounds over a few months. That can be a sign of active TB. Finally Michelle forced her to go to the doctor. "If it wasn't for me taking her, nobody would have ever known she had TB because she wasn't going to go," she says. Still, weeks would pass before the diagnosis was made. Doctors at Boston Medical Center recognized right away that Judy Williams had severe, untreated diabetes. And they suspected TB because a chest X-ray showed suspicious shadows on her lungs. But it could have been lung cancer. They scheduled a followup CT scan. But Judy, who had a terrible fear of doctors and hospitals, skipped the appointment. At one point a visiting nurse called the hospital from the Williams home. Boston public health nurse Michael Malone says he warned the doctors that "there's a lot of people in and out of this household ... so if this is TB, there's going to be a long list of people exposed to Judy." Judy Williams' TB didn't get diagnosed for another month or so, after she was rushed to the hospital by ambulance in a diabetic crisis. While she was there, doctors established without a doubt that TB had eaten a large cavity in her left lung. "That suggests her TB had been active and unchecked for an extended period of time," nurse Malone says. It also made her maximally contagious. And then there was a slip-up. Once she was past the diabetic crisis, Judy Williams was sent home. She should have been quarantined at a TB treatment center until she was no longer contagious. But she was discharged over Martin Luther King weekend 2011, and public health officials didn't get notified in time. They had the legal power to require her to stay in the hospital for treatment. Another factor: Judy Williams was a strong-willed woman who made it very clear she had no desire to stay in the hospital. A month later, she began coughing up copious amounts of blood at home. The family called 911, and Judy was rushed to the hospital, but it was too late. "I knew she was dead," says daughter Michelle. "I seen my mother — I hate talking about it — when I went to the hospital ... just laid up on life support." After a week, she authorized the doctors to pull the plug. Her mother was 59 years old. Robert, who was especially close to his mother, was so distraught he couldn't bring himself to go to her funeral. 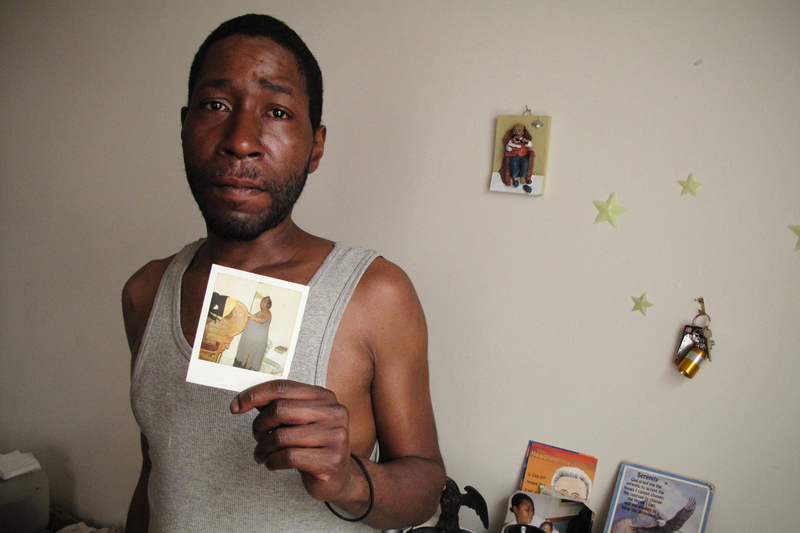 Robert Williams, 42, holds a photo of his late mother, Judy Williams. As soon as Judy Williams was diagnosed with TB, Boston public health workers began testing the family to see if she'd infected others. "Around 20 people in the extended family were tested," Malone says, "and about half of those showed evidence of TB infection." All were in the latent or early stage of infection, which means they had no symptoms and couldn't pass TB to anyone else. That's one of the hallmarks of TB: Most people who get infected go a lifetime without ever getting active, contagious disease. But if left untreated, when something happens to lower their immunity, the infection can roar to life, attacking lungs, kidneys, spine, brain or other parts of the body. In Judy Williams' case, it was probably her untreated diabetes that lowered her immunity and gave the TB germ its chance. All but one of the people identified as TB-infected after Judy Williams' death completed a voluntary, nine-month course of medicine to prevent the infection from progressing. At this point, the public health people thought they'd done their job. So they were shocked when last October, 20 months after Judy Williams' death, her 35-year-old nephew came to the hospital with advanced TB. "It was a very painful discovery," Malone says. "He'd had two skin tests which pointed away from any infection. He was never offered prevention medicine because there was no indication for it. And yet he obviously had been infected." This family tree charts the way TB spread through four generations of the Williams family and friends. The infection started with Judy Williams, top center. It spread to her husband Jesse, her son Robert and daughter Michelle, her nephew, three of Michelle's daughters and one of her sons, a boyfriend of one daughter, a girlfriend of a son, and three of Judy Williams' great-grandchildren — 15 people in all. Only four had active TB infections, which are contagious. The rest had latent infections with no symptoms, which can become active infections if not treated. Then, a month later, a 20-year-old man came to the hospital with active TB – the boyfriend of one of Judy Williams's granddaughters. Meanwhile, Judy's son Robert had been losing a lot of weight. Around Thanksgiving of last year, he felt he couldn't breathe. TB had eaten a large hole in his lung. Robert went willingly to a state hospital for two months of quarantine until he was no longer infectious to others, and remains on outpatient treatment. DNA testing showed all three men were infected with the same strain of TB as Judy Williams — meaning they got it from her. But all three men had tested negative for TB on two successive skin tests done weeks apart back in 2011. "We thought it had to be a fluke, really an outlier, that someone would have negative skin tests and be infected with TB," Malone says. "But that is one of the limitations of the test. Some people just don't respond." Unfortunately, a nonresponse is more likely when someone has active TB or lowered immunity for some reason, such as HIV infection. And sometimes the results can be wrong when health workers don't wait long enough between the first and second skin tests. "We may have done our second round of testing too quickly in this case," Malone says. The public health nurse, whose full-time job is battling TB in the community, says the Williams family's story is a sobering reminder of how challenging it can be to track TB infection and prevent its spread. After the three new cases of active TB popped up, another round of testing revealed three more infections — all in people who had tested negative in early 2011. They include daughter Michelle, her first husband and her 4-year-old granddaughter. So now, more than two years after TB was first diagnosed in the Williams family, they're still struggling with the disease. Every day Robert takes a bus to the Boston Medical Center, where a nurse watches him take a handful of pills. If he starts missing doses, he could develop a resistant form of TB that's more dangerous and difficult to treat. Michelle makes sure that she and her granddaughter Ayniah don't miss a dose of medicine or a monthly checkup. "I take mine every day," Michelle says. "I saw what happened to my mother. I don't play with it. Since my mother passed, it's just too scary for me." Within a few months, everybody in the Williams family will finish treatment. Then they can finally put TB behind them.